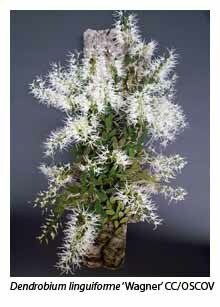 In principle, all epiphytic orchids are suitable for growing on mounts made from tree branches, cork, old hardwood fence palings or other long-lasting material. 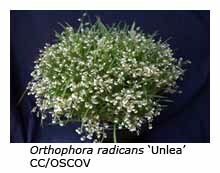 However, in practice, some species perform better than others, particularly those with roots that like to dry out before the plant is watered again. Other species may still flourish on mounts if their roots are covered with a layer of damp, living Sphagnum moss. Mounted orchids invariably require watering more frequently than those growing in pots. As a general rule, they need to be watered or misted at least daily during the summer months, depending upon their position in the shade-house. Mounts suspended in a breezy position dry out very rapidly, whereas those positioned horizontally on a bench need watering less often. When mounting plants, place the orchid directly onto the mount and then cover the roots with a thin layer of bush moss or Sphagnum moss before securing the lot firmly to the mount with nylon fishing line, old pantihose strips or plastic-covered wire. The ties should ensure that the plant is firmly fixed to the mount but should not be so tight as to damage the stem or roots. Neolehmannia porpax (syn. Epidendrum porpax, Nanodes mathewsii) is a miniature Central American species found between Mexico in the north to Peru in the south. New growths are produced freely, enabling this species to spread rapidly and thus cover its mount in a few years. The glossy brown and green flowers, produced singly from the new growths, last for many weeks. This species may also be grown in a pot, although it soon spreads over the rim and will eventually encompass the pot. The main flowering season is autumn to early winter. Encyclia polybulbon (syn. Epidendrum polybulbon, Dinema polybulbon) is another miniature Central American species native to Mexico and the West Indies. This species also spreads rapidly to cover its mount in a few years. Each new growth produces a single, long-lasting flower in autumn, winter or early spring. The petals and sepals are yellow with brown flushing, while the lip is white. It does well when mounted on a slab of virgin cork. Dockrillia linguiformis (syn. 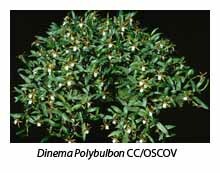 Dendrobium linguiforme) is a well-known Australian species found growing on rocks and trees in coastal NSW and Queensland. 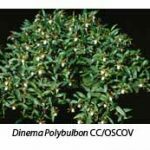 This species is easily recognised by its characteristic furrowed, fleshy leaves. The feathery white flowers, 5-20 per inflorescence, open in spring. My plant grows well on a piece of old fence paling. Coelogyne fimbriata is widespread throughout the Himalayan mountain chain, mostly at altitudes around 1500 m. This species needs a mount of substantial size. Each inflorescence carries several flowers but they open only one at a time. The sepals and petals are pale yellow, while the prominently fringed lip is yellow with brown markings. 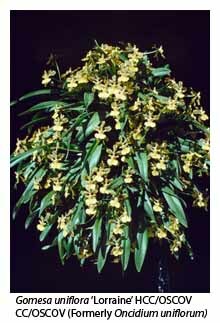 Oncidium uniflorum is found in the Organ Mountains of Brazil, inland from Rio de Janeiro. It should be watered daily in spring and summer, less often during the remainder of the year. 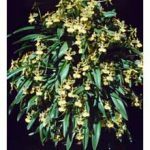 Each growth produces two or three new growths during spring and summer, and consequently Oncidium uniflorum soon spreads to cover its mount. Each new growth produces two (rather than one, as the name implies) long-lasting flowers in autumn. 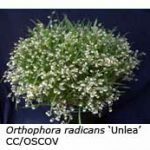 Ornithophora radicans (syn. 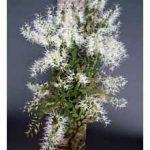 Sigmatostalix radicans) is a miniature Brazilian species with grass-like foliage and long, dangling roots. The tiny flowers, 5-8 to the raceme, have narrow green petals and sepals, a white lip and a contrasting purplish black column with a yellow tip.